When Intel brought Teresa Herd on board in 2014, she had one mission: give the company a rebrand. She has more than succeeded. 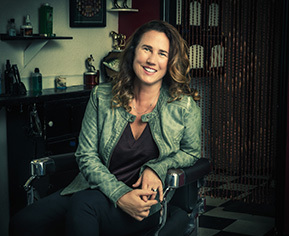 Now the VP global creative director, she is responsible for defining and leading Intel’s global creative vision through Agency Inside, Intel’s in-house shop. This includes providing creative expertise and leadership across all communication channels globally to increase brand value and create demand for Intel products. As creative director, Herd oversees all creative development—for advertising, collateral, brand and website–and leads a global and integrated creative process across all geographies. Since the internal agency’s inception in 2015, Herd has grown her team to over 85, composed of internal resources at Agency Inside as well as a strong production and content creation arm, Intel Global Production Lab. Herd has driven the creative to rebrand Intel, launching Jim Parsons in a global product campaign, the 2016 Grammys program with Lady Gaga, the Super Bowl 51 integrated campaign and the Makers and Experience Amazing content series. She developed and launched the "Intel Inside, Amazing Experiences Outside" platform, which reversed a 5-year brand decline. For the third year in a row, Intel grew brand value as measured by Forbes, Brand Z and InterBrand. The company also enjoyed record sales and record stock price in 2017. Agency Inside was also integral to the drone show broadcast during the Opening Ceremony of the 2018 Pyeongchang Olympics. The performance set a new Guinness World Record for "most unmanned aerial vehicles airborne simultaneously," surpassing Intel’s own record, which it set in 2016. Outside the corporate space, Herd received an Emmy nomination in the "Outstanding Commercial" category for her Women's March film, "Why I March," last year, which garnered over 12 million views with zero paid media. Herd also drove the creative development of the logo and graphic design system for the Women’s March.